Wales is renowned for some great riding. 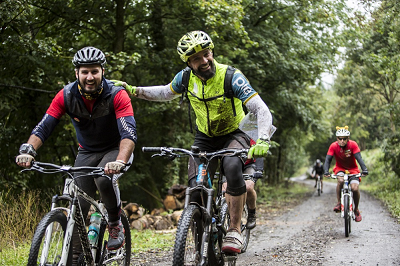 Our route within the Brecon Beacons National Park incorporates something for everybody, with quiet canal paths, ascents through the forests and technical downhill sections in the shadow of Pen Y Fan. Combined with fantastic Welsh hospitality, what more could you want! Arrive at your leisure, in time for an evening registration and bike fit with the pie team. We start the Challenge with an early morning breakfast, followed by an event safety briefing before splitting off into your guided groups and heading out into the fresh air! Setting off from Brecon, we follow the River Usk and pick up the Taff Trail. The climbing starts as we ride up towards the Talybont reservoir and the first refreshment stop of the day, which has stunning views across the valley. From here, the gradient gets steeper as we zig zag up the nearby Tor y Foel hill. Once we have reached the top, it’s a gentle downhill ride towards the lunch stop & transition zone near the Pentwyn reservoir, where you will be able to change out of your cycling clothing and into your hiking gear. 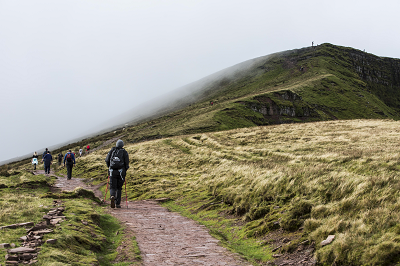 The hike in the afternoon has two route options available, either going via Cribyn or Pen y Fan, which is the highest peak in South Wales. Both routes offer, if the weather is kind, spectacular views across the Brecon Beacons and if you squint hard enough, you may even catch a glimpse of the finish line in the distance! After the mandatory photos at the summit, we continue our journey down towards Brecon and a well-earned celebratory drink. In the evening a celebration meal will be held so that all Challengers and supports can toast your achievements and look forward to the next adventure! Morning at your leisure before travelling home.